It was a wild day in the nation’s capital Sunday, and we’re not just talking about the weather. And after the day began with reports Redskins coach Mike Shanahan wanted to quit last season, it ended with a report that the franchise already has a plan to move forward with a new head coach. The day started with an ESPN report that Washington Redskins head coach Mike Shanahan cleaned out his office before last season’s wild-card game against Seattle, planning to leave the organization at season’s end. The issue, according to the report, was the way owner Dan Snyder "empowered [then-rookie QB Robert Griffin III] and openly esteemed him above all other players," and the report added that the coach was angered at Snyder’s coddling of Griffin, as opposed to the star QB himself. Of course, RG3 would suffer a torn ACL and the Redskins would lose that game, but Shanahan stuck around, enduring an offseason and preseason in which speculation over Griffin’s health and public disagreements between coach and QB over when RG3 would take the field dominated headlines. For his part, Shanahan said after the game that it was not the right time to address Sunday morning’s reports and that he would talk to Snyder at season’s end. You can see that news conference here. Then came late Sunday, when CBS Sports reported that the franchise already has a new coach in mind should Shanahan be let go of. And the news could make Snyder’s star very happy. Griffin will have a voice in this process, and he is a huge Briles guy. 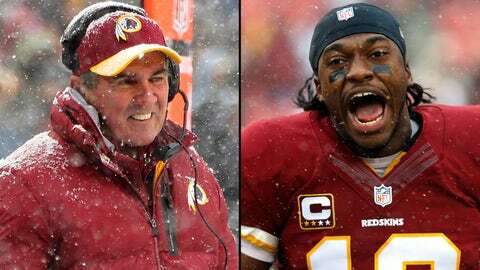 Briles managed RGIII's health, ego and family in college. Later in the night, FOX NFL Insider Mike Garafolo countered the Shanahan-Texans talk, but had some shocking words about the mood of the coaching staff in Washington right now.